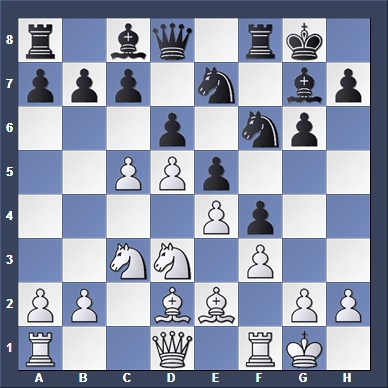 The pawn chain is not a unique feature of the Advance French-- it is also present in many other closed games, notably the King's Indian. 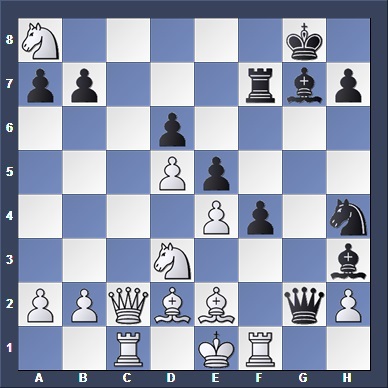 In fact, many King's Indian games feature a closed position where the central pawn chain divides the board into two, thus provoking both sides to attack on opposite wings (remember what we talked about in July?). 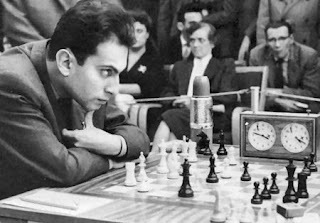 Today we will examine such a game, played none other than the great Mihail Tal himself. Larsen has quickened his attack by using a slightly different move order. He has omitted the prepartory move b4 in order to attack the d6 base more quickly, and try to open up the c-file. 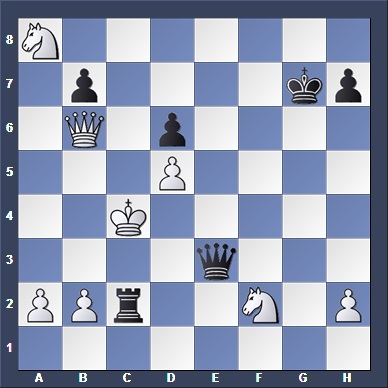 White was hoping to provoke 15... a6, after which 16. cxd6 axb5 17. dxc7 Qd7 18. Qb3 gives him a strong advantage. By advancing his g pawn, Black seeks counterplay on the kingside in order to counter White's kingside activity. He is ready to sac his pieces in exchange for a powerful attack on the enemy king. 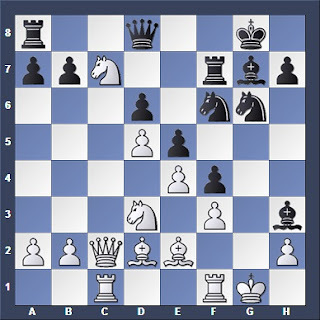 This move probably took Larsen by surprise; he had been hoping for 20... Qxa8 21. Nf2 Bxf1 22. Bxf1, where he will then be able to establish a powerful bishop on h3. Had he forseen Black's move, he would have been more cautious and played 20. Ne6 instead. Of course, Black could have drawed with a perpetual on Qh4+, but Tal was not satisfied and wanted to play for a win. In trying to save his knight, White has placed his king in danger. More stubborn would have been 34. Qc3+ Qf6 35. Qg3+ Kf8 36. Nd3, activating the knight. As the attacker, your pawn chain gives you much space in the centre, while the forward wedge controls vital squares within the enemy camp. Thus, you should utilize these squares to bring in your pieces for the attack. As the enemy's central pawns are blockaded, you can also seek to make flank attacks on them. At the critical moment when the chain falls apart, the attacker should attempt to bring his pieces into the centre. If he succeeds, then his pieces will exert suffocating pressure within the defender's position, while the enemy blockaded pawns become exposed and vulnerable. If he fails to do so, then the formerly blockaded pawns will advance with all their pent-up energy, thus changing the nature of the game and turning the tables. Very often, the centre can become closed, in which play will naturally be transferred over to the wings. Both sides will usually seek to make parallel attacks on opposite wings. 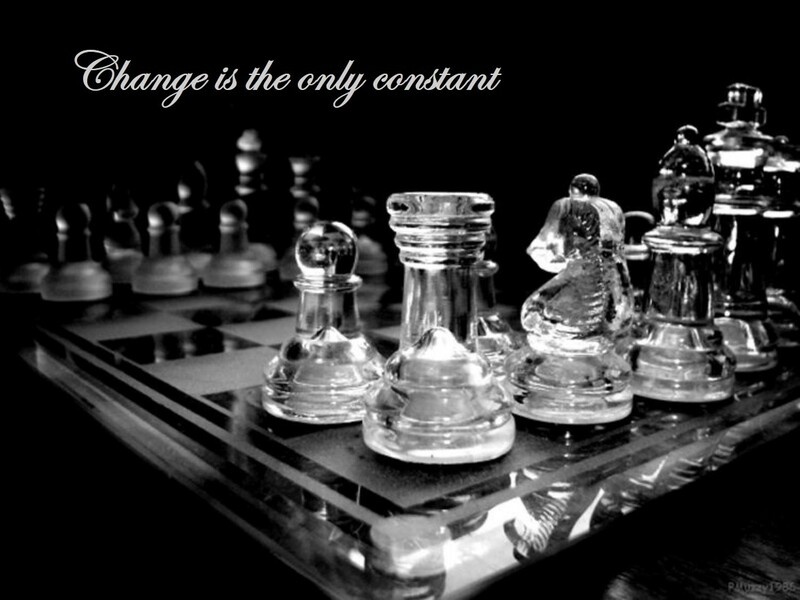 This, I hope, will aid you in your efforts both with and against the pawn chain in future games.